For more than 15 years, Jenni Semelroth has generously donated her time, expertise and dollars to Indian Creek Nature Center. A former Microbiologist and Science Teacher, Jenni has dedicated countless hours as a volunteer Teacher Naturalist devoted to teaching children about the wonders of nature. Jenni has been incredibly charitable to the Nature Center, not only with her time and expertise, but also with her dollars. 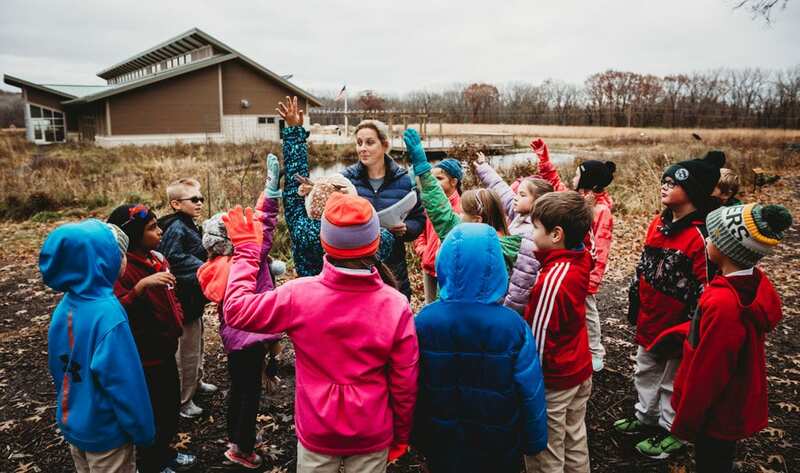 For this Giving Tuesday, Jenni and her husband Tim have generously contributed $2,500 toward Indian Creek Nature Center’s goal of 100 donors helping fund its high quality environmental education field trips. Field trips are one of the key ways the Nature Center creates Champions of Nature. Connecting children to nature in a fun, hands-on, educational way is critical to nurturing an early appreciation for our natural world that we believe will grow into a passion to protect it for years to come. Indian Creek Nature Center strives to keep our field trips affordable and accessible to everyone, but they do cost money. For just one child to attend a field trip at the Nature Center, it costs participating schools between $3 and $4. But the true cost to the Nature Center is between $18 and $20 per child, which leaves a gap of $15 (on average) that the Nature Center covers. On this Giving Tuesday, we’re asking donors to help close that gap. Just $15 directly supports one child on a field trip at Indian Creek Nature Center, as well as the dedicated staff and volunteers (like Jenni) that provide the high quality environmental education we’re known for. The Semelroth’s lead donation of $2,500 is an incredible start to our campaign, and will give nearly 170 students the opportunity to attend a field trip at the Nature Center. That’s enough to educate more than five full classes in nature! As a Teacher Naturalist, Jenni knows first-hand the impact this can have on a child. “Their eyes just light up,” she said of children who attend the Nature Center’s field trips. Among many reasons for donating to the Nature Center, Jenni said she wants to give everyone the opportunity to experience the “spark” that comes from learning in nature. Do you, like Jenni, want to protect our natural world through high quality environmental education? Your donation — no matter the amount — makes a difference. Help us reach our goal of 100 donors this Giving Tuesday, Nov. 27. You can also help by “liking” the Nature Center on Facebook and sharing our #GivingTuesday posts on social media. Tell your friends how they can help, too! Questions? Please email Liz Zabel at lzabel@indiancreeknaturecenter.org or call 319-362-0664. Thank you for helping us achieve our mission to create Champions of Nature!